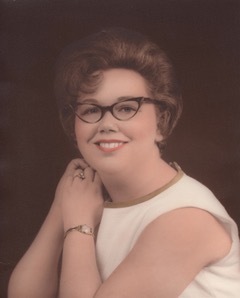 Deanna Thomas Payne of Lockhart, Texas, formerly of Austin, Texas, and Lennox, SD, passed away January 27, 2019 at the age of 74. Deanna was born in Fergus Falls, Minnesota, on August 27, 1944, to the late Bernard and Marvis Thomas. She was the eldest of the three Thomas sisters, and some say the sweetest. Deanna married Ross Payne on October 22, 1965. She worked in the Thomas family business, a traveling carnival. She also held a license in cosmetology. Deanna enjoyed cooking, spending time with her family, and the music of Elvis (whom she saw twice in concert) and George Strait. Deanna is survived by her husband, Ross Payne; sisters, Margaret Atkins and Carolyn Hanschen; daughters, Dawn Kingsbury and Lisa Jardine; grandchildren, Jeanette, Matthew, AJ and Amanda, and many cousins, nieces, and nephews.